Story: Oliver Owl is Henery Hawk's friend. 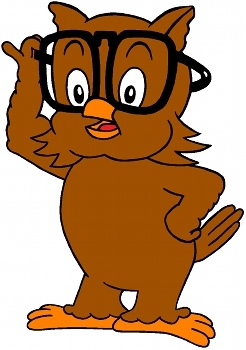 Background notes: Oliver Owl first appeared as one of the school kids in the cartoon I Haven't Got a Hat from 1935. This appears to be his only appearance in cartoons as a part of the cast, but he was seen on the title page for Looney Tunes in several other cartoons. A character looking like a dog with tail feathers seen in Plane Dippy from 1936 has a lot of visual similarity with Oliver and may be mistaken for the character, but it is not. When Dell started publishing Looney Tunes series, starting with Looney Tunes and Merrie Melodies Comics in 1941, Oliver was cast as the annoying goody two-shoes and friend of Henery Hawk. Here he was mostly called Ollie, and he was given a mom and dad. Though they appeared quite often in the comics, they were never given any names. In comics Oliver first appeared in Looney Tunes and Merrie Melodies Comics #37 from 1943, and was a regular in the various Looney Tunes series until Beep Beep the Road Runner #67 from 1977. There is no indication of Oliver Owl appearing on any merchandise or anywhere else outside the comics. There may be some Henery Hawk merchandise to be found, having Oliver Owl shown as well.